Sale Sharks have signed Nottingham fly-half Dan Mugford for next season. 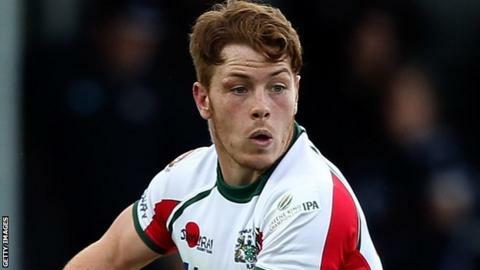 The 24-year-old progressed through the academy at Exeter but, after failing to break through, moved to London Scottish and has also played for Plymouth. With Danny Cipriani and Nick Macleod confirmed as leaving Sale, Mugford will compete with new signing AJ MacGinty next season for the number 10 shirt. "He's a good player. We feel we can do something with him," said director of rugby Steve Diamond. "He's certainly an attacking threat and from what we've seen he's reasonable defensively - he's young, full of enthusiasm and we're delighted to have him." Mugford has featured in 16 of Nottingham's 21 Championship games this season as they sit seventh in England's second tier. "It's a fantastic environment and a big step up to join an established Premiership club like Sharks," he said. "I look forward to giving it my best shot and am very grateful to Nottingham for helping me progress my game."